Toronto, Ontario, January 28 (FSCwire) - Mongolia Growth Group Ltd. (YAK – TSXV and MNGGF – USA), ("MGG") or ("the Company") a commercial real estate investment and development company participating in the dynamic growth of the Mongolian economy announces the release of its December 2015 Shareholder Letter. In December 2015, MGG's core commercial property portfolio* experienced a same-store rental decline of 12.3% relative to December 2014 on properties owned 12 months or longer, as measured in Mongolian Togrog (MNT). Total billed revenue for December 2015 was 244.2 million MNT, as compared to 251.0 million MNT in December of 2014 or a 1.4% decrease. ** The occupancy rate for the core portfolio in December of 2015 was 87.4% including an occupancy rate of 84.4% for core retail properties and an occupancy rate of 91.7% for core office properties***. The World Economics Headline Sales Managers' Index (SMI) for Mongolia has indicated a contraction in Mongolian economic conditions since early 2014; however, MGG didn't feel the effects of this contraction until mid-2014. Since then, the rate of negative activity has accelerated dramatically with much higher tenant turnover, vacancy and bad debt expense along with dramatically reduced market lease rates. During December, these negative trends again accelerated—much in line with readings from the SMI and Business Confidence Index which in December, fell to 32.4 and 27.9 respectively or the lowest readings on record. All of this negative momentum was before the recent decline in commodity prices could be factored into economic conditions. It seems likely that conditions will continue to deteriorate, before hopefully stabilizing in late 2016 as a result of renewed investment into Mongolia's massive Oyu Tolgoi copper mine. Unfortunately, without a recovery in commodity prices, any economic recovery will likely be subdued at best. Until then, weak conditions will likely get worse. As a result of the accelerating deterioration in rental rates and unpredictability surrounding occupancy levels along with dramatically increased tenant turnover, we no longer have any visibility to predict our revenues going forward. Over the past few months, successful initiatives that have led to increased revenues outside of the core portfolio, have been more than offset by declines in revenues within the core portfolio as tenants continue to abandon existing leases at accelerating rates. Despite the fall off in market rental rates, we remain hopeful that we can keep overall revenues in 2016 from declining too drastically —as compared to our thinking only a few months ago where we expected revenues to increase into 2016 on the back of our revenue initiatives. The only bright spot in this picture is that we've begun to earn fees from agency work and as our presence in this sector grows, we believe that this could become a larger contributor to revenues in the future. During times of economic stress, property owners seek out experienced firms that can help them to lease and sell property and we should be beneficiaries of this trend. As the economy continues to deteriorate, the focus of our attention has to once again return to reducing costs in order to ensure that we can survive no matter how bad the economy gets. Following the completion of an addition to leasable space at Tuguldur, we will cease all development activity and refocus on ways that we can reduce costs. Despite having reduced run-rate costs by nearly as much as our annual revenues over the past year, there are likely to be additional cuts that we can make—however these will be much more difficult than prior ones. The only place where we expect for net spending to increase is in marketing, in order to maintain our occupancy. As the largest shareholder of MGG, I have always focused on long- term performance at our business and given the increased volatility in monthly results, I think it is now prudent to focus investor attention to our quarterly and yearly results going forward. As a result, this will be the last monthly letter for the foreseeable future. 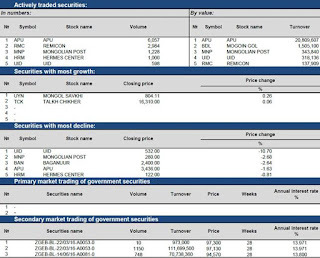 Despite the current negativity surrounding the economic situation in Mongolia, over the past few weeks, I have purchased additional shares of MGG. Three other insiders have also joined me in purchasing shares. While things are very difficult today and likely to get worse, I remain a long term believer in the future of Mongolia and believe that MGG is in a position to thrive once the economy recovers. We look forward to updating you again on our progress and new developments in the future. January 28 -- Haranga Resources Limited ('the Company') is pleased to report on its activities for the December 2015 quarter. Following the grant of its Mining License by the Mineral Resources Authority of Mongolia ('MRAM'), the Company has been focusing on the completion of the activities required by the mining related laws and regulations in Mongolia. The Company has now received the final draft of the Detailed Environmental Impact Assessment ('DEIA') required by Mongolian mining law. Management is reviewing the DEIA before finalisation and submission to the Special Committee of the Ministry of Environment and Green Development. Once approved by the Special Committee, the DEIA will be submitted to MRAM for final concluding approval. Management is currently reviewing the strategy of the Company in regards to the Selenge Project ('the Project') and the operational options available in order to maintain the Company's position in the Project, taking in to account the current status of the iron ore market globally. Throughout the quarter, Wolf Petroleum Limited ('the Company') contin­ued to progress negotiations with a potential strategic partner from China in regards to a farm out of the SB Block in Mongolia. The general terms of a farm in agreement have been agreed, but due to record low oil prices and delay of financial commitment from the potential strategic partners the farm out process continues to take longer than anticipated. The Company will update shareholders with its results and provide plans for the 2016 shortly. The Company is applying for a production sharing contract with the Mongolian government for the 100% held BU and Jinst Blocks. The out­come of the application is expected in the fourth quarter of 2016. 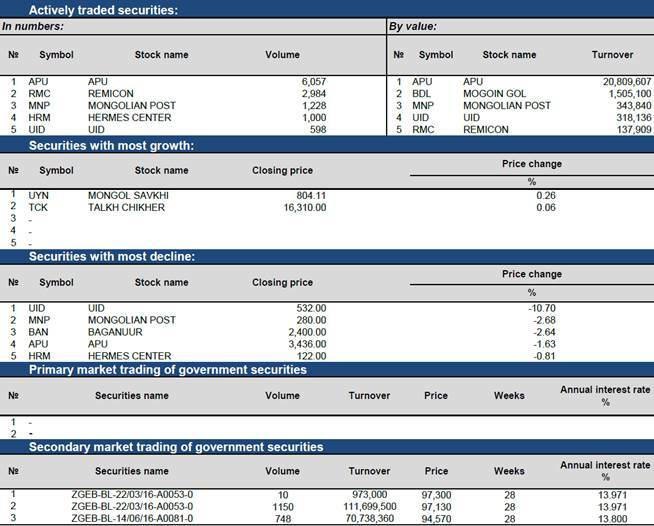 On 31 December 2015, 27,000,000 listed options (WOFO) exercisable at $0.20 expired unexercised. On 28 November 2015, 1,000,000 unlisted options exercisable at $0.33 expired unexercised. January 28 -- The securities of Viking Mines Limited (the "Company") will be placed in Trading Halt Session State at the request of the Company, pending the release of an announcement by the Company. Unless ASX decides otherwise, the securities will remain in Trading Halt Session State until the earlier of the commencement of normal trading on Monday, 1 February 2016 or when the announcement is released to the market. January 21 -- During the three months to 31 December, 2015, Perth-based Viking Mines Ltd (Viking or the Company) activity was focussed on concluding the sale agreement for the Akoase gold project in Ghana to Akoase Resources Limited. As previously reported, the Mongolian Government has been in the process of reviewing and amending the Law on Prohibiting Mineral Exploration and Extraction Near Water Sources, Protected Areas and Forests (commonly referred to as the "Long Name Law"). Following recent announcements, including a Government Resolution that licence areas in headwater zones and river basins are to be annexed and revoked, the Company has been advised by the Ministry of Tourism, Green Development and Environment that approximately 53% of the Berkh Uul prospecting licence falls within a headwaters of rivers zone. This government determination impacts upon the Company's current coal resource and Viking continues to engage in discussions on this matter with the Mineral Resource Authority of Mongolia (MRAM) and the Ministry of Tourism, Green Development and Environment. MRAM and the Ministry of Tourism, Green Development and Environment have indicated they are prepared to review the Long Name Law zone boundaries at Berkh Uul on receipt of a formal written submission. This submission is in preparation and will be lodged next quarter with MRAM. A number of project farm-in/acquisition opportunities were considered during the quarter. None are currently at an advanced stage of consideration. Viking will continue to pursue these and any other opportunities, which are complementary to its existing project portfolio and consistent with its core objective to acquire near term production assets with potential to deliver sustainable cash flow. January 28 -- Draig Resources Limited (ASX: DRG) (Draig or the Company) is pleased to provide its Activities Report for the quarter ended 31 December 2015. January 28 -- Petro Matad advises that the Annual General Meeting ("AGM") of the Company will be held at 4.30 p.m. local time (8.30 a.m. GMT) on 5 February 2016 at Blue Sky Tower, Topaz Conference Hall, Peace Avenue 17, Sukhbaatar District, Ulaanbaatar, Mongolia. January 28 (BoM) On the Foreign Exchange Auction held on January 28th, 2016, the BOM has received buying bid offers of USD 45.7 million in a rate between MNT 2006.50-2009.91 and bid offers of CNY 23.7 million in a rate between MNT 304.20-305.20 respectively. The BOM sold USD 19.0 million in a closing rate of MNT 2009.05 and CNY 8.0 million in a closing rate of MNT 305.0. On January 28th, 2016, the BOM has received MNT Swap agreement buying bid offers equivalent to USD 0.74 million and USD swap agreement selling bid offers of USD 15.0 million from local commercial banks and the BOM accepted the MNT swap agreement buying bid offers of USD 0.74 million. Ulaanbaatar, January 28 (MONTSAME) At the meeting of parliamentary Standing committee on Economy, Bank of Mongolia (Central Bank) presented information about reduction of interests of pension and salary loans, and credits for herdsmen, small and medium enterprises, in connection with the decreased inflation rate. President of the Bank of Mongolia N.Zoljargal said that 2015 saw its first positive performance of inflation rate improvement inline with GDP growth since 2006. GDP showed 2.5% growth by the end of the third quarter of 2015. Between 2009 and 2012, GDP raised by 40.2%, and the consumption of low and medium income households increased by 7.7-10.1%, he informed. One third of inflation was formed solely by meat and petroleum price increase in 2010-2012. Supply-push inflation pressure was eliminated in 2013-2015. The pressure of foreign exchange rate has not been contributing to inflation since August of 2014. Most importantly, portion of households with average monthly income of 500 thousand – 2.3 million MNT was 39% in 2011, and the portion advanced to 67% in 2015, he said. Total of 240 billion MNT of credit was distributed by State Bank and Khan Bank to herders, with 2.5% monthly interest, which rate is very high. This is burden on agri-businesses and livelihoods of herdsmen. The current annual interest 30% can be reduced to 10%, given the decreased inflation rate. January 28 (news.mn) The General Director of the "State Apartment Corporation" (SAC), A.Gantulga, has announced that an "Apartment Rental" program will take effect from 1st March 2016. The Ministry of Building and Urban Construction is working on the rules and regulations of the program, following which, the SAC will approve their internal rules for the program; this should happen before the end of February. The SAC, therefore, is planning that the program will take effect from March 2016. Under the program, 579 apartments will be available for rent nationwide of which 350 will be in UB. People who rent the apartments will not be able to obtain mortgages, and must belong to living standard categories 3-10. The apartment rent rates will be MNT 200,000-280,000 in UB and MNT 140,000-230,000 in other parts of the country. The renter can live in the apartments for a maximum period of 5 years. January 28 (gogo.mn) Retail gasoline prices of Ulaanbaatar city dropped by MNT 80-150 starting Jan 21st, reported by the Ministry of Mining. 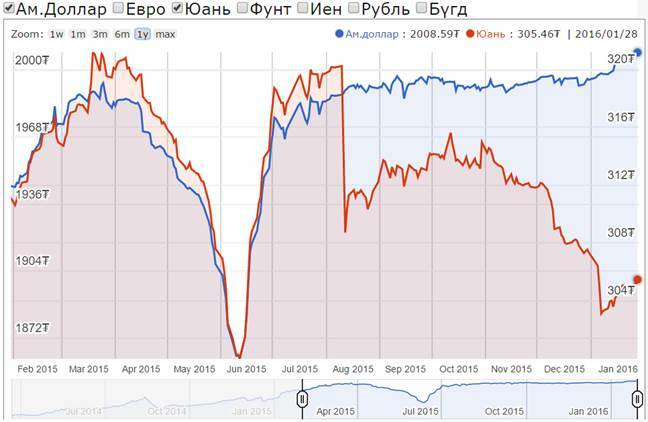 In December, 2015, retail gasoline prices fell by MNT 80-400 in Western region while it fell by MNT 10-230 in Eastern region. Moreover, gasoline prices plummeted by MNT 100-150 in Umnugobi, Dornogobi, Huvsgul and Arhangai aimags starting Jan 20. Due to gasoline supply was too dependent on a single company, border gasoline prices were higher than regional markets with USD 300-400 per ton. 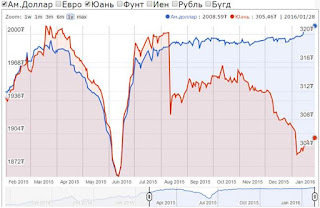 Border prices, taxes, exchange rate of MNT against USD and operating costs affect the gasoline prices. The Government has stabilized the retail prices by changing the taxes. Stop granting the soft loan to gasoline importing companies from Jan 1st, 2015 and the interest rate was set at 16-18 percent. Custom tax on gasoline was increased to 5 percent on Feb, 2015. As of 2015, total of MNT 160 billion was collected to state budget from only gasoline taxes. January 28 (Bloomberg) -- Mongolian Prime Minister Saikhanbileg Chimed survived a no-confidence vote in parliament today escaping criticism over his handling of the economy and the development of the underground mine Oyu Tolgoi. * "It's a major political victory for the DP and ruling coalition"
26MPP+3JC+1Ind+1LNP=31, 91% accuracy for our forecast , MP-s Kh.Bolorchuluun(Ind. ), Ch.Ulaan(JC) and D.Terbishdagva(JC) did not show up for the vote, against our forecast. Further, we note that in our Front-running Flash exclusive to Premium Subscription " Expecting No Confidence to fail with 40:32 vote" 13 hours ago, we also have been expecting JC MP-s Ch.Ulaan(JC) and D.Terbishdagva(JC) to not show up for the vote because of their long standing convictions on opposing OT. For safety, however, we have conservatively sticked to downside, more cautious scenario. · clear delineation of Parliament into Govt supporting moderate ruling Coalition of DP, Govt supporting JC ex-radicals,CWGP vs. radical minority of JC radicals, independents and Labor National Party aided by opposition MPP, which effectively publicly admitted that it will "join up with devil" for political gain, at any cost without disregard for voters' best interests as electorate majority was opposed to Govt instability. This high cost includes also alienating professional, pro-business and educated Mongolians in UB. The development raises question on political strategy capability of the MPP going into 2016 elections. · By fixing 8% residential mortgage program stall and pump priming it further to 5%, successfully ensuring Govt stability, showing its maturity as political party, DP is improving its chances in 2016 elections, in particular, in view of proposed split of 22 Parliament tickets for UB and 26 tickets to countryside, a move fiercely opposed by MPP, because it traditionally more stronger in countryside and , in our opinion, real reason for MPP joining No Confidence proposal. · We expect DP will keep momentum and approve both 5% residential mortgage pump priming scheme and Gatsuurt state stake bill before Tsagaan Sar, Lunar New Year. · With stable Govt, OT and Gatsuurt moving, Mongolia is laying good foundation to tackle its Global Competitiveness challenges during commodities super cycle downturn. January 28 (news.mn) Yesterday, an event entitled "Development Revolution" took place at the Trade Unions' Central Palace of Culture. This was to mark the 5th anniversary of the Special Session of the Mongolian People's Revolutionary Party (MPRP). After an opening concert, N.Udval, an MP and a member of the MPRP's Executive Bureau made a speech entitled "Five years of Struggle and Hard Endurance"; MP Ch.Ulaan, another member of the Executive Bureau, Member of Parliament and Director of the Budget Standing Committee spoke on the theme of "Let's Solve Oyu-Tolgoi Together". The "Development Revolution" event had photograph exhibitions on the subjects of "Mommy, I'm Hungry", "History of Restoring the Party Name" and the "Arrest of N.Enkhbayar". Approximately, 1000 MPRP representatives from every khoroo (ward) of the nine districts of Ulaanbaatar and all 21 provinces attended the session. G.Byambasuren, who is MPRP Secretary for UB said: "Five years ago, we announced a program of fair and just actions - today, we are concluding everything we have done over the last five years. Mongolia put state development on hold for 25 years following the 'Democratic Revolution'. Therefore, MPRP has introduced a 'roadmap' for a future 'Development Revolution'". DEMOCRACY. On the ground, the air of freedom makes itself felt, a back note to the smog from coal-burning stoves. No one here looks nervously over their shoulder. No propaganda blares out of loudspeakers. There are no shadowy figures to tag you or bug your hotel room. Political parties operate freely. The citizens choose their leaders. But democracy's dividends are unevenly spread. BETWEEN WORLDS. The capital, Ulaanbaatar (UB), was once a complex of Buddhist monasteries. Bulldozed into a place of boulevards and apartment blocks, it has doubled in size in recent years, with glass towers, department stores, Korean restaurants and karaoke bars. Car traffic has a stranglehold on the city. Beyond downtown, UB splinters into pricey condos and rustic gers(yurts). The latter have cherished ancestral value, but no piped water or toilets. NOMADS. Mrs. Urnaa and husband Mr. Jambaljamts (spouses do not share surnames) are preparing to uproot their ger and livestock for the winter. Their living space is tight and the lifestyle frugal, but they have satellite TV, solar panels and motorized transport. Under communism, farming was collectivized. The couple equate democracy with the ability to own cattle: their herd, consisting of various animals, is 300-strong. While they voice broad satisfaction with their conditions, they have a diffuse sense of dishonesty and malpractice in public life. THE ANALYST. Sumati Luvsandendev, a mathematician turned sociologist, is Mongolia's best-known pollster: he has accurately forecast the result of every presidential election, a complex exercise in a country where many have no fixed abode. His surveys confirm that perceptions of injustice are widespread among Mongolians, although they continue to support democracy and free markets. "When you switch from a communist to a democratic system, the rule of law should be a priority. But our institutions have lagged behind requirements." POLITICS. After the break-up of a left-right 'super-coalition', the government is dominated by conservative Democrats. Lundeg Purevsuren, Minister of Foreign Affairs, agrees that the state must become more responsive to its own citizens. This is also, he says, where IDLO's expertise is needed. Even as it strives for multilateral visibility (for instance, by acting as a 'third neighbor' broker in talks with North Korea), Mongolia aims for better governance standards at home. THE ECONOMY. In a small economy doped by double-digit growth, 2015's forecast 2.3 percent feels like a slump. Mongolia is overreliant on mining: any fall in commodity prices, investment pause, or drop in Chinese demand for minerals translates into budget cuts. After much stalling, undeground production is due to begin at Oyu Tolgoi (Turquoise Hill), a multi-billion dollar copper and gold mine near the Chinese border. Asked to make two wishes, people in the mining industry are quick to name 'good laws and independent judges'. Other investors deplore a shortage of institutional continuity as governments change. REFORM. Sanjaasuren Zorig (third right in the canvas, with glasses) is viewed as a hero in Mongolia. A leading light of the pro-democracy movement, he was murdered in 1998 in mysterious circumstances. In the wake of this death, his sister Oyun took up civic and political activism. An MP and former Minister of the Environment, she argues that the systemic aspects of democracy are in place. But, she says, policymaking needs refining to serve business AND social justice. THE JUDGE. For the rule of law to take hold, Mongolia's judicial sector must ensure a safe, fair and predictable legal environment for both business and society. Justice Mishig Batsuuri of the Supreme Court is an IDLO fellow: he has gone on to become a trainer for the Organization, improving judges' grasp of commercial and competition law. Despite perceptions of the profession as open to pressure and opaque to change, he points to great progress in the rule of law. "One example of rule of law development is the new administrative court system. People now use it whenever they feel wronged by officials or institutions. And officials, rather than spend their time in court, are learning that they must respect the letter and spirit of the law. Another big step is the General Administrative Law, which should come into effect next July. Never before have we had a law that actually tells officials when they're doing things right and when they're doing them wrong." HUMAN RIGHTS. Progress in matters of civil law aside, there is concern about Mongolia's criminal justice system. Author, politician and civil rights advocate Oyungerel Tsedevdamba has served as Presidential adviser on human rights and public participation. She warns against what she sees as recent backsliding. Lack of respect for the defense in court cases is undermining the pursuit of justice, she says: without a human rights culture, the rule of law is just a punitive concept. URBAN SOCIETY. Nogi and Muno, both software engineers by training, live in relative comfort in a socialist era housing project. Muno (right) has co-founded a small travel agency; Nogi is looking for a new job while caring for their three children. Possible emigration to the West is at the back of their minds. Life can be good in Mongolia, they say, but there is little safety for women and children. Violence is rife. Out on the street, Nogi does not trust law enforcement to protect her: if something were to happen, she thinks she'd get more help from strangers. "There are many cases of domestic abuse, but they're not often reported. In our building, people get drunk and behave in an intimidating manner. Alcohol is a big problem. If you call the police, they just give them a talk and that's the end of it. It sometimes feels as if the law only works for powerful people." THE VIOLENCE VICTIM. Law enforcers do try to help, albeit with limited means. On the outskirts of Ulaanbaatar, in a police-run shelter for abused women and children, Chimgee (not her real name) is cradling her toddler: she came looking for refuge, psychological support and a hot meal. While she received all three, it is unclear where she is to go next. We used a cartoon to protect her identity. "One drink, and my husband would turn into a monster. He would beat me up again and again. He even started beating on the kid. In the end, I left." THE POLICEWOMAN. The shelter's chief, Police Major D. Serjmyadag, says that until 2004, there was no understanding of domestic violence in Mongolia. The law passed that year has since shown its limitations; a more comprehensive one is being debated in Parliament. Even so, funding is short; coordination between state bodies needs improving. The police are one of the agencies targeted by IDLO as it launches a program to combat gender-based violence. "On average, we have attended to 30 people or so every month this year. Medical attention is the priority. If the victims need hospital care, we refer them; if the injuries are minor, we treat them here. In one case, an underage victim came to us after being stabbed in the arm in a domestic attack. " media driven campaign, allowing abused women to break their isolation. "The very first thing the abuser does is take away or break the victims's cell phone. So we asked people to donate their used phones." Across sectors and concerns, the sum of conversations with politicians, public bodies, private citizens, entrepreneurs and activists confirms Mongolia as an untypically open society on the Asian steppe. Pluralism is established. Solidarity networks are emerging that bode well for the country's future. But few would deny that to sustain and develop its democracy, Mongolia must strengthen its institutions; diversify its economy; embed human rights in judicial practice; and strive to extend equal protection and opportunities to all. January 28 (news.mn) The ASEM conference will be held on 15th-16th July in Ulaanbaatar. Approximately, 3500-4000 international representatives will visit Mongolia together with other guests and journalists. The planners consider that between 320 and 350 cars will be required for ASEM. The ASEM preparation team is working to establish contracts with private sector cars importers and to use their cars for the event. Due to this contract, the cars will be used without tuition. Subsequently, the Government has presented a draft bill to Parliament proposing exemptions on customs duties and taxes (including VAT). Along with the cars, other imported items for ASEM such as equipment for the airport, border control and hotels will also be exempted from taxes. January 28 (news.mn) In the framework of Hungarian Prime Minister Viktor Orban's visit to Mongolia, a meeting between representatives of the Hungarian State Printing Company and the heads of the State Registration and Statistical Authority has taken place. During the meeting, the two sides made a contract to update Mongolian foreign passports. The main change is the inclusion of a new international standard data chip. The Hungarian State Printing Company produces passports with and without chips, documents for crossing border crossing, travel documents, permission to settle in European Union, permission documents for proposed asylum seekers, refugee and immigration documents and other similar items containing sensitive information. The official website of the State Registration and Statistical Authority informed that the new chip passports will mean that Mongolian citizens will have fewer problems, when crossing borders; they will offer more security. January 28 (gogo.mn) In scope of upcoming Tsagaan Sar celebration, City Governor`s Office and Ulaanbaatar City Mayor`s Office are jointly organizing the trade fair of Tsagaan Sar at Chinggis Square with the aim to reduce the burden on congestion on roads. The trade fair opened on Jan 27 and will be finished on Feb 08. Residents are enabled to buy leather, wool and cashmere products, meat products, dairy products, flour, pickles, and national costumes and boots at discounted price. In addition, meat and dairy products trade will be organized in six districts. Ulaanbaatar, January 28 (MONTSAME) A meeting of the parliamentary Standing committee on security and foreign policy discussed Thursday an issue whether considering a draft resolution of parliament on establishing diplomatic relations with some countries. The Minister of Foreign Affairs L.Purevsuren presented a report of the draft resolution's report. Saying that Mongolia has established the diplomatic relations with 181 countries so far, the Foreign Minister reported that the government has signed joint statements on establishing diplomatic relations with Gabon, Saint Lucia, Niger, Cameroon, and Marshall Islands. A majority of the parliamentarians backed to create the diplomatic relations with these countries. January 28 (news.mn) The annual "Khaan Quest" military training exercise is planned to take place from 22nd May to 4th June. The purpose of the "Quest" is to improve the skills of peacekeeping operations and cooperation between Mongolia and the USA. This year, the United States Pacific Command, Organization for Peacekeeping, and Mongolian Armed Forces are the joint organizers. Last year, troops from 23 countries including the USA, Russia, Australia, Bangladesh and Belarus participated in the training. This year will be larger, with trainers from 47 countries taking part. Therefore, the director of the Mongolian Armed Forces, Peacekeeping Support Authority, B.Erdenebat, has said: "This year's "Khaan Quest" will be extended and have wider status". The "Khaan Quest" has being organized since 2003, with the co-operation of Mongolia and the USA. Since 2006, the training has upgraded to a truly international event. Moreover, it has become one of the best five peacekeeping training programs in the Asia Pacific region. January 28 (gogo.mn) We deliver you the interview with D.Gankhuyag, State Secretary of the MFA and Chairman of the ASEM Mongolia Office, to talk about the significance of organizing the ASEM summit, the status of the preparations for the summit and other related issues. -Shall we begin our interview first with a reflection on the Mongolia-ASEM history? -ASEM is not only a forum between Asia and Europe. It is also an informal process of dialogue and cooperation, based on promoting equal partnership and enhancing mutual understanding. It is also an open forum for decision makers, policy makers, researchers and academics, civil society figures and businesspeople to discuss issue and express opinions of common interest. Mongolia became an ASEM member only in 2008, and within this short span of time we are hosting this important forum in our country. This can be viewed as a major accomplishment for our country, a huge responsibility, as well as a rare historical opportunity. Since ancient times, Mongols have been striving to link the West with the East and to establish peace and tranquility à la Pax Mongolica. They have played an important role as a geographical, economic and cultural bridge, linking the West and the East and we hope to continue to carry out this important responsibility in the future, too. The successful organization of the ASEM Summit would give us additional opportunities to make the world better understand and appreciate Mongolia. -For the first time ever Mongolia would be hosting the Heads of state and government of more than 50 countries at one and the same time. How well are the preparations for the ASEM Summit proceeding? -The Prime Minister-headed National Council as well as the Council's working groups and the ASEM Mongolia Office are all successfully fulfilling their respective duties and functions to ensure the successful preparation of the summit. The expansion of the capacity of the Chinggis Khaan International airport has been ensured and additional aircraft stands have been built. A lot of work has already been accomplished by way of selecting the hotels that would accommodate the high level guests and accompanying delegates, working groups, journalists and media people coming for the ASEM Summit, improving the quality of hotel services, and building the capacity of the hotel personnel. The construction of the ASEM Villa that would house the heads of the delegations to the Summit is nearing completion. Roads, bridges and fly-overs have been built a new, expanded or renovated with the objective of improving the traffic in the city of Ulaanbaatar. We are also working closely with the European Union and the European member countries of ASEM in training translators and interpreters for, as well as managing the protocol of the ASEM Summit. Planned actions for promoting Mongolia to the world, promoting its history, and culture, socio-economic development are already being implemented in anticipation of the Summit. -Many side events would be organized during the ASEM Summit. Can you please elaborate what they would be? -Besides the Summit-level meeting, 9 different side events are planned to be organized during the Summit involving the business, civil society, parliamentarians and the youth. The host countries of the previous ASEM Summit had not organized this many side events during an ASEM summit. This is an expression of the enormous trust being bestowed on us by the Asian and European countries. This is precisely why we are also trying our best to ensure the success of the Summit. Another important feature of the Summit in 2016 is that it coincides with the 20th anniversary of ASEM itself. Mongolia has now a dual important responsibility of drawing the road map for the next 20 years of ASEM. In order to live up to this important responsibility with honor, many ASEM member countries are working closely with us. -The hosting of the ASEM Summit would become a historical event for our country. Can you share with us your thoughts on the significance of this event? -Mongolia for the first time ever would be organizing a large-scale summit that is expected to bring together the Heads of state and government of many Asian and European countries. The organization of this summit in the country can be regarded not only as a matter of honor and great responsibility but also as the peak of success and accomplishments of the country in its foreign relations and diplomatic efforts 25 years after Mongolia's transition to democracy and renewal of its foreign policy doctrine. The successful organization of the Summit will help further solidify Mongolia's international prestige, ensure many more countries support our foreign policy doctrine and active international efforts, and expand cooperation with them. The Summit would also help make progress in the national tourist and services sector, and have a positive impact on reintroducing the flow of foreign investment in the country. The Summit would not only help popularize the centuries-old national history, customs and traditions, arts and culture throughout the world, but would also help consolidate the historical experience and gains in social relations. What's more, we would gain new experience in organizing international level meetings and forums in the future. And we are confident that this would make it possible to host many more similar international activities. -Thank you, and taking this opportunity, I would like to thank and wish good luck to everyone for their sincere contribution, effort and time to ensure the successful organization of this landmark event in the country. January 28 (gogo.mn) Preliminary Results from the Ugaar Randomized Intervention Study of Air Pollution and Fetal Growth was introduced today and it shows that 130 children and 1400 adults die from air pollution in Ulaanbaatar city annually. According to the study conducted among the capital city, air pollution has been shown to exacerbate pneumonia of children and cardiovascular disease​ of adults. In other words, air pollution is not the cause of any diseases, it aggravates the disease and makes life threatening. In last five years, bad effects of air pollution of Ulaanbaatar city was increased by two times, reported by the PhD and Director of School of Public Health, Mongolian National University of Medical Sciences O.Chimedsuren. Moreover she cited that not only outdoor air pollution but also indoor air quality is not good enough. Indoor PM 2.5 levels are high and 50 percent of indoor air pollution is caused by cigarette smoke. Exposure to fine particulate matter (PM2.5) has been associated with hospital admissions and several serious health effects, including premature death. School of Public Health, Mongolian National University of Medical Sciences have conducted "UGAAR 1" study in cooperation with Simon Fraser University since 2010. Next study called "UGAAR 2" will be continued until 2020 and will come up with specific information on how to protect yourself from air pollution. The study provides evidence to support the hypothesis that air purifier use during pregnancy may reduce the effects of air pollution exposure on impaired fetal growth. January 28 (news.mn) The project "Higher Education in Engineering and Technology" to prepare 1000 engineers in Japan is being successfully implemented. The purpose of the program is to improve standards of engineering, human resources related to teaching and to prepare skilled technological experts and engineers. In the framework of this project, a ceremony took place earlier today, in which 94 students, teachers, and researchers received official confirmation to study in Japanese universities from Minister of Education Culture and Science L.Gantumur. The ceremony was also attended by the Japanese Ambassador to Mongolia Mr. Takenori Shimizu and Mr. Sato Mutsumi the country-representative of the Japanese International Cooperation Agency (JICA). January 27 (Alaska Public Media) Efforts to end domestic violence brought a delegation from Mongolia to Nome on Monday. The group — made up of social workers, shelter managers, police officers, and more — was there to learn how Alaska is addressing high rates of sexual assault and domestic violence. Mongolian delegates and local leaders discussed the hard issues affecting both communities over lunch. It's noon at Nome's United Methodist Church, and the Inupiaq choir welcomes over a dozen Mongolian delegates with a performance of "Praise Ye the Lord." The music kicks off a meeting hosted by members of the Bering Sea Women's Group, the Nome Social Justice Task Force, and other community leaders. Beyond forming new friendships and sharing homemade salmon patties, the goal is to give their Mongolian counterparts an idea of how Alaska responds to domestic violence. When it comes to this issue, the two places have a lot in common. That's according to Tuvshinjargal Gantumur, a psychologist and manager at the National Center Against Violence in Mongolia. Through a translator, she said the similarities between Alaska and Mongolia are what made the delegation eager to take this "study trip." "There are some similar statistics and rates. Like the rates of domestic violence and sexual assault cases — they're relatively high right now. And in terms of geography, we also have rural areas — where people are scattered — in Mongolia. So all the experiences that Alaskan people have already achieved will be interesting for us." The delegates heard all about those experiences from their first stops in Juneau and Anchorage to their final visit in Nome, where they toured the Anvil Mountain Correctional Center, Norton Sound Regional Hospital, and the district attorney's office before learning about specific Nome initiatives against domestic violence. Ultimately, though, the Monday lunch meeting wasn't really about statistics or hands-on training. Instead, the main message from Nome leaders was that no community can address domestic violence with getting at the cause. And for many places, including Alaska and Mongolia, that means understanding how colonization and racism have inflicted lasting trauma on Native people — and how that trauma manifests in domestic violence and other social issues that aren't easily solved. With that attitude in mind, Gantumur said the delegation is excited to get back home and continue their work, with new insight from — and an ongoing relationship with — their new connections in Alaska. "We have a lot planned when we go back. We will do advocacy towards changing the legislation implementation process and also prevention activities. We are also planning to have consultants from Alaska come over to Mongolia, so they will also teach us in the field." Returning the favor, the Mongolian delegates wrapped up the meeting with some music of their own. Performed in the Mongolian language, they said their song was about a mother's unconditional love. January 27 (UNDP) Mongolian version of the State of the World's Volunteerism Report (SWVR) 2015 from the United Nations Volunteers (UNV) programme was launched. The Report was translated into Mongolian by UNV Mongolia in collaboration with Online Volunteers in Mongolia. Launched globally in June 2015, the SWVR 2015 is the first global review of evidence around the contribution of volunteers to better governance, a pre-requisite for the success of the new Sustainable Development Goals agreed at the United Nations in September 2015. Volunteers are playing a vital role in making governments worldwide more accountable and responsive to their citizens, but their potential is seriously under-valued, the Report says. Drawing on evidence from countries as diverse as Brazil, Kenya, Lebanon and Bangladesh, the SWVR 2015 shows how ordinary people are volunteering their time, energies and skills to improve the way they are governed and engaged at local, national and global levels. Mongolia also holds ample examples of volunteers who have supported inclusive voice and participation in the society, not included in the State of World's Volunteerism Report 2015 though. Through the "My World Survey" in the lead up to formulating the 2030 Agenda for Sustainable Development, more than 5,000 Mongolians had their voice heard globally through. Collecting feedback from Mongolians in remote areas was possible with support of volunteers from the UN Youth Advisory Panel of Mongolia. January 28 (NPR) The Eagle Huntress, a documentary film set in Mongolia directed by Otto Bell and starring teenager Aisholpan Nurgaiv, debuted Sunday at Sundance Film Festival in Park City, Utah. With its focus on a charismatic girl who has accomplished something other women have not in 2,000 years — she hunts on horseback with the help of a golden eagle — the film has earned standing ovations. January 28 (Snow Leopard Trust) Mongolian snow leopard researcher Sumbe Tomorsukh has been posthumously awarded the Freeman Family Snow Leopard Conservation Award, one of the most prestigious honors in the field, for his outstanding efforts to save this endangered cat. Snow Leopard Trust Executive Director Brad Rutherford presented the award to Sumbe's family at a memorial ceremony held in Ulaanbaatar. Sumbe Tomorsukh tragically passed away in 2015 much before his time. He was only 27. His death is an irreparable loss to his family and friends, as well as to all of us personally and to the Snow Leopard Trust as an organization. It is also a huge loss for Mongolia, and for the international snow leopard conservation community. We share Sumbe's family's grief, and together with our colleagues in Mongolia, we stand with them through this terrible time. We are honoring their wishes and doing whatever possible to support them in this difficult time. Sumbe's death has raised many questions, and there have been reports in Mongolian media alleging that he was the victim of a crime, which may have been related to his work as a snow leopard conservationist fighting to protect the cats' habitat in the Tost Mountains, in Mongolia's South Gobi province. We are following those reports closely and are standing ready, doing what we can to help his family get answers. We have high respect for the Mongolian government and authorities. We have requested them to conduct a fair, thorough and transparent investigation into his death, and to help realize Sumbe's dream of saving the snow leopards of Tost. Welcome to the Official Launch of the UN-REDD Mongolia National Programme. When we think about climate change and the contributions by different sectors to greenhouse gas emissions, usually the energy and transport sectors come to mind. But globally, around 10% of greenhouse gas emissions are generated through forest loss and forest degradation. Forests cover about 4 billion hectares of the world's land surface. Most forests occur in the Tropics and Northern hemisphere in Canada, the US, Europe, Russia and China. While forests, cover only about 8% of Mongolia's total land area, let us keep in mind that this is still an impressive 110,000 square kilometers, the size of the total land area of Bulgaria. As such, Mongolia can therefore also play a significant role in climate change mitigation through, the sustainable management of its forests and restoration of degraded forests. This is also important because Mongolia ranks in the top 8 of the most vulnerable countries to climate change with average temperature increases over the last 70 years having already surpassed the 2 Degrees Celsius mark. The effects such as desertification, higher likelihood of dzuds, melting glaciers etc impact heavily on Mongolia's natural resource dependent nomadic herders. And let's also remind ourselves that forests provide numerous other services, beyond carbon sequestration or storage, that are required for our economy and people to prosper. Looking at the recorded contribution of the forest sector to GDP in Mongolia (currently about MNT 70 billion or 0.5 % of GDP), it would be easy to believe that our forests have only little value. The reality is very different. Selected services of the Mongolian forests are worth more than MNT 430 billion per year to the national economy. This is more than six times higher than the more narrowly defined official statistic that does not capture the full economic value added of forest goods and services. Now financial incentives to take better care of our forests are often in short supply. This will change in the near future. Under the UN Climate Change Convention (UNFCCC), its members have worked over the last ten years to establish what is called the REDD+ mechanism, where REDD+ stands for "Reducing Emissions from Deforestation and Forest Degradation". The idea behind REDD+ is to provide so-called "results-based payments" to developing countries that can demonstrate that through forest conservation they emit less greenhouse gases, as compared to a business-as-usual scenario. And only in December last year in Paris, 195 nations reached a historic climate change agreement that clearly spells out that business-as-usual is not an option anymore, if we want to safeguard the sustainable future for our planet. The UN-REDD Programme, an initiative jointly implemented by the Food and Agriculture Organization of the United Nation, the United Nations Development Programme and the United Nations Environment Programme, is providing support to the Government of Mongolia, to get ready for REDD+. It will work together with the Ministry of Environment, Green Development and Tourism and other stakeholders over the next three years to assist Mongolia in meeting all the requirements to ultimately be eligible for results-based payments. Goal 15. To protect, restore and promote sustainable use of terrestrial ecosystems, sustainably manage forests, combat desertification, and halt and reverse land degradation and halt biodiversity loss. The partners in the Programme will coordinate their efforts with other activities, such as the work on a national forest inventory supported the German International Cooperation Agency, and a Global Environmental Facility project assisted by FAO, which is supporting forest user groups in the better management of their forests to improve their livelihoods. As you can see, the UN-REDD Programme will go beyond carbon sequestration, and is therefore a very welcome and critical addition to our efforts in watershed management, biodiversity conservation and poverty reduction through livelihood improvements of rural people. I wish the National UN-REDD Programme great success and stand ready to offer my support. January 28 (gogo.mn) Don't hide at home next Saturday, come out and join us for the UB Winter Festival 2016! The UB Winter festival is to take place for the 3rd time, and everyone is invited. And the weather forecast says it'll be warm & sunny! The Mongols are privileged to enjoy four seasons in the year, and Mongolian winter is famous for being so wonderful. Ulaanbaatar city Tourism Department is organising the UB Winter Festival, with a vision of making the festival one of the biggest winter events in Asia. The festival features both traditional Mongolian & international sports as well as modern and traditional arts. Traditional Mongolian archers will compete in the ice archery competition, and dog sledges, paragliding, ice skating will also be demonstrated. Spectators won't only watch the games and performances, but also can take part in the tours and competitions. Everyone will have so much fun! UB Winter Festival is to take place at the Ulaanbaatar National Park (Үндэсний Цэцэрлэгт Хүрээлэн) on Saturday, 06 February. Hot food, hot beverages, souvenirs, winter & sports clothing trades will be available for spectators & participants during the festival. All spectators can take part in the dog sledding, winter biking tours, horse riding, camel riding at certain charges, and ice skates & sledges will be available for rent.